This year I created, and managed, the social media platforms for the fundraising efforts of the Whitman Team for the Duke MBA Games. 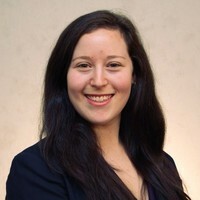 I believed that utilizing the power of Social Media would amplify our message, and would help our team gain more donations from outside the Whitman and Syracuse community. This experience has taught me more than any classroom exercise. I started my efforts by writing an email to the school’s daily newspaper, The Daily Orange, telling them of our efforts, and of the launch of our social media platforms. Additionally, every tweet mentioned Syracuse University or the Whitman School, and all used the hashtag Special Olympics or DukeMBAGames. My goal was that anyone who followed that hashtag (mostly the Special Olympics, or any of the state Special Olympic boards), would see the tweets, and start following our handle, and retweet us. I didn’t realize how difficult it was to gain followers if you aren’t a known business or cause. Additionally, without the assistance of the school paper or other news outlets on campus publicizing our efforts, most of the school community never knew of our efforts, either this year or last year. Even worse, we won last years games, and the majority of the campus never knew. Our first fundraising event of the year was a ’70s themed ice skating event at the Syracuse University Ice Rink. In addition to making flyers, which were put up around campus, I advertised and reached out through social media. 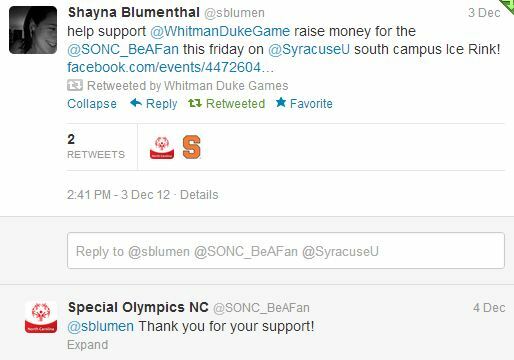 Using both the Whitman Duke Games Twitter account, and my personal account, I tweeted at the University, the Special Olympics of North Carolina, Newhouse, and other Syracuse accounts, using the hashtags #DukeMBAGames and/or #SpecialOlympics. By using these hashtags, my goal was that other universities would start to use them, and by the Duke MBA Games, one of them would trend. The ice skating event raised over $200, which we were very pleased about. After the ice skating event, I continued to reach out to the University to through social media, promoting our fundraising activities, the Duke MBA Games, and our donation page. In early January, the Syracuse University Twitter handle didn’t just retweet, but tweeted about the Duke Games (of course after I had tweeted at them). I am still managing both the Twitter and Facebook pages for the Whitman Team, and will be until the Duke MBA Games in April. As I continue through the rest of the year, I am optimistic that we will gain a larger social media presence, which will increase our fundraising efforts. Additionally, as I continue through this process, I am sure I will continue to fail and I learn what doesn’t work, but I am sure I will succeed as well as I learn what does. 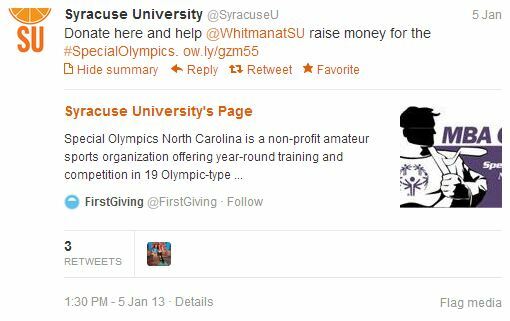 Social Media/Community Manager: Syracuse University’s team to raise money for the Special Olympics of North Carolina. Created and managed the Twitter and Facebook pages for the Whitman team. From the social media pages, created awareness throughout the Syracuse University community.